Craig Wayne Boyd was one of four finalists for season seven. (CNN) -- Get to know the name Craig Wayne Boyd -- he's officially music's newest "Voice." 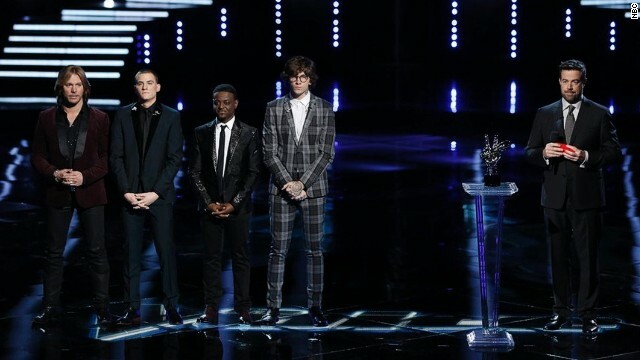 On Tuesday night, Boyd was named the winner of the seventh season of NBC's "The Voice," beating out three other finalists who were coached by Adam Levine. Team Levine's Damien came in fourth place; Chris Jamison came in third; and singer-songwriter Matt McAndrew was the runner-up. Boyd was coached by country star Blake Shelton, who has previously led three other "Voice" champions to victory. All four of Tuesday's finalists were popular with fans, as evidenced by how quickly their original songs charted on iTunes. During Monday's episode, Damien, Jamison, McAndrew and Boyd all revealed new singles, and all four are now in the top 10 on iTunes. That includes Boyd's "My Baby's Got A Smile On Her," which he performed again after his big win on Tuesday. That song's soulful vocals show exactly why America fell hard for Boyd, who won hearts earlier in the season with his rendition of the hymn "The Old Rugged Cross." Originally from Mesquite, Texas, Boyd relocated to Nashville a little more than 10 years ago. Despite releasing an album and performing regularly, his career didn't take off the way it has now. "Probably one of the reasons that I had not had huge success in Nashville yet is because I always stuck to my guns," Boyd reflected in an interview with The Tennessean earlier in December. "What's great (about) going to 'The Voice' is I sing those songs that I would want to put on an album, and America loved that. That's what's kept me around, and I'm looking forward to the future." His present isn't looking too bad, either. After performing "Sweet Home Alabama" with Lynyrd Skynyrd during Tuesday's finale, the legendary band sent Boyd a congratulatory note.